On Wednesday, we were invited along to an exciting preview of a new concept Thorntons store which opened at Intu Derby yesterday (2nd November). We were amongst the first few to get a sneaky look into the store which is the first of its kind, and what an exciting store it was. As you enter the store you are instantly greeted with lots of chocolatey goodness, this is the largest Thorntons store I've ever seen. As you enter the store you are greeted with a lovely craftery section to the left with the shop products on your right hand side. The shop sells everything you would generally get in a Thorntons store and there was a lovely range available. 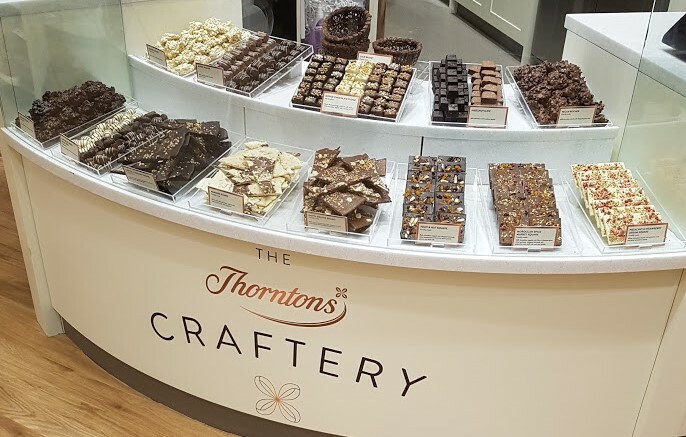 Within the craftery section you are able to see a trained store chocolate maker at work demonstrating the passion, care and love which goes into each and every one of the Thorntons products. Everything made within the store is available to purchase from the front cabinet which will be changed every few weeks to ensure there is always a variety of products. You are also able to see the chocolate constantly being pumped through, this is flowing at the perfect temperature to ensure each chocolate have the glossy look and set quickly. I took Isla along with me and she was absolutely in love with this area, and I know Jack would have been equally as enthusiastic. As I mentioned previously the items you know and love are still available and the personalisation we have all come to love and associate with Thorntons is available in top for. You are able to really personalise to individual features and make the item individual to yourselves. However, it doesn't all end there, the cafe within the store has had an all new makeover too, I didn't even know Thorntons had cafes with a new and exciting menu alongside. Upon the menu there is everything from breakfasts, to snacks, to salads and of course amazing deserts and cakes. The cafe has changed to a table service style cafe, so you can sit back and relax and the team will take care of everything. The seating area is very warm and welcoming with various seating styles to sit within. Upon the menu there are handcrafted ice cream sundaes, warming hot chocolates which were to die for and milkshakes which have been inspired by the Thorntons Continental range. The milkshakes range between £3-£4 and are well and truly worth it. When you compare with others, nothing really compares to what has gone into these. I mentioned above the Hot Chocolate, now I am prone to a hot chocolate or five, its my go to hot drink as I'm really not a coffee lover. But finding a nice hot chocolate which meets y standards is generally really hard but Thorntons hit it right there. They are priced around £3 but well and truly worth that, made from chocolate flakes with a range of variety, such a smooth and creamy drink. Now onto those cakes I mentioned, there are new cakes upon the menu including a Salted Caramel Praline Torte, Alpini Cake and Triple Moose Brownie. We were given a selection of five to try, of which I left two as I'm not keen on coffee or lemon so they were out. But the Alpini Cake was amazing, certainly my favourite out of all of them. Derby is not our nearest shopping centres, however I will certainly be returning to enjoy the amazing Thorntons store alongside my family. It's a place I know we would all enjoy as a treat and somewhere I would love to take them too. Please Note: We were provided with a goody bag for attending this event, however all thoughts and opinions are my own and not influenced in any way.